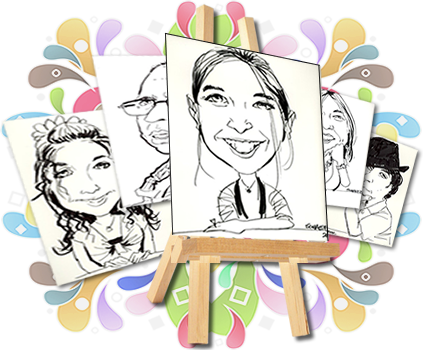 Let Creative Caricatures provide entertainment at your next party or function! There’s nothing quite like having a professional caricature artist to draw a crowd. Give your guests something unique to take home with them! Welcome to Creative Caricatures! If you’re looking for a great caricature artist in Adelaide, then look no further! Creative Caricatures can provide you with quality live entertainment for your next function in Adelaide. Entertain your guests with something special. Creative Caricatures specialises in live caricatures. Give your guests a special memento of your next event, function or party by bringing in a professional caricature artist! Like what you see? Creative Caricatures' competitive pricing means you don't have to pay more than you need to for quality, artistic caricature work. With years of experience in Adelaide, South Australia, Creative Caricatures offers friendly service to every customer. Contact Creative Caricatures and book that unique entertainment for your next party, or find out more about having a special caricature portrait created from your own photos. Professional, experienced caricature artist, looking forward to hearing from you!